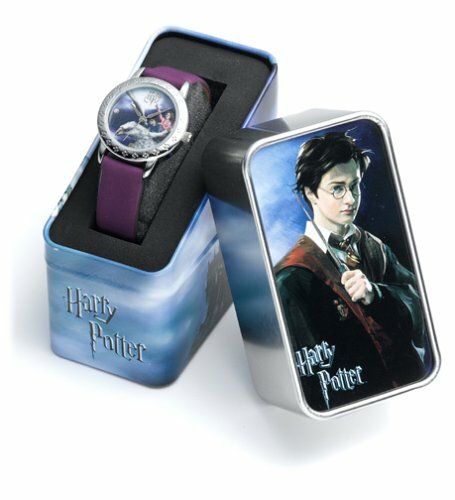 Harry Potter Prisoner of Azkaban "Buckbeak" watch, out of production and rare, collectible, new with warranty and box. Ladies or youth watch depicting Hermione Granger and Harry Potter flying on the back of the hippogryff Buckbeak. Polished silver watch with diamond shapes embossed in bezel. Silver hour, minute and second hands. Dial in hues of violet/blue/pink with slender, purple man-made band. Water resistant. Precision quartz, analog time.Offered by SII Marketing for Warner Brothers. Licensed, official Harry Potter Warner Brothers product. Rare and collectible. Wonderful gift!